Loksatta Jayaprakash Narayan , an ex government official who worked and moved very closely with film star,ex-cm,TDP founder late Nandamuri Taraka Ramarao revealed few interesting facts about NTR. The words spoken by JP shows us the nature of NTR and his commitment towards people’s safety,security and economic standard. JP ,who once was a close associate of NTR worked under him at CMO and advised NTR many time when the state was in a critical crises. Later in the recent days during 2009 election JP entered politics with NTR as inspiration and gave a tough competition to TDP and made it sit in opposition. However JP lost up everything in 2014 now sat calm looking at future politics. 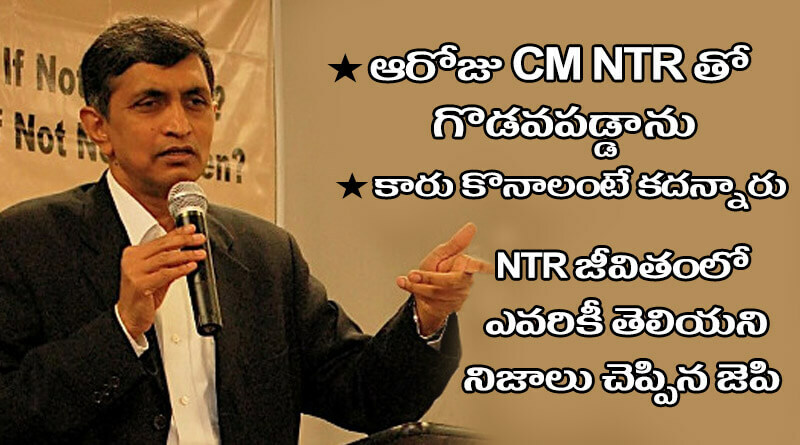 Here is the video in which JP spoke of NTR in his own words.